A new study by the Harvard Joint Center for Housing Studies finds that in the next two decades, more than 20 percent of Americans will be over age 65. As they get older, those Americans will need homes that feature universal design elements like zero-step entrances, single-floor living and wider hallways and doors. Just 3.5 percent of today’s homes offer all three of those elements. “Visit able” is a less demanding accessibility design standard that requires an accessible path, wide doorways and an accessible toilet. This idea is a person with mobility impairments could visit. Few existing houses even meet this standard of welcoming. Prospective buyers whose incomes qualify go thru a conventional lender to get a mortgage and then work with a realtor to purchase a Trust home. The Trust is able to help buyers with a program that requires only $500 down and can provide up to $15,000 in mortgage assistance or closing costs. The Trust is a young organization. 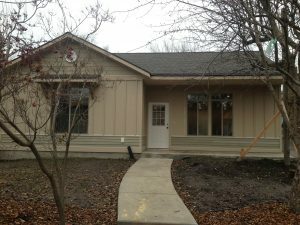 It purchased its first house from foreclosure and rehabilitated it. Its second house is new construction, nearing completion in December 2016. That house lists for $165,000, which with the $15,000 assistance could mean a mortgage of $150,000. It was in the design of the second house that the Trust adopted its commitment to make houses as accessible as possible and super energy efficient. The site for house #2 is nearly flat, sloping gently down to the front, making a roll-in entrance from the rear parking area a possibility. Wide doorways and hallways plus a bathroom with room to turn a wheelchair complete the design. To keep the market price down the house has only two bedrooms. The Trust is learning about the costs of accessible design. Some things take planning, but have no construction cost. Others, like larger bathrooms and wide hallways, have cost implications because they make the house bigger.